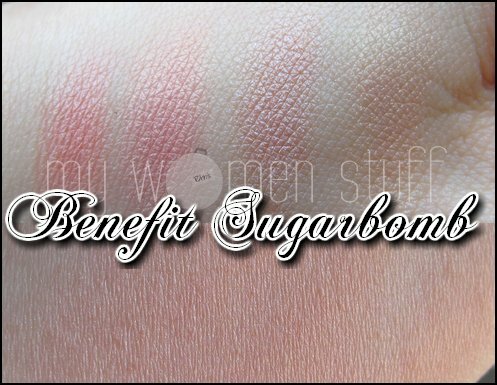 Benefit Cosmetics has me at their powder blushes or what they call their Box-o-powders. I have Dandelion, Georgia and Coralista and am very happy with them. So when I saw Sugarbomb being launched, my spidey senses were tingling. I had to have it! And thanks to a little spree (ahem!) before the new year, I am now Sugarbomb-ed! Isn’t she pretty? Purchased at US$28 (RM99) online and should retail at RM130 at Benefit Cosmetics counters just like the other powders. Not sure if its here yet though so give a shout out if you have seen it 🙂 I’ve got some quick swatches below. Once I get round to using it properly, I’ll do up a proper review. From preliminary observation, the colours not super shimmery but it isn’t all that sheer as Karen has opined – its quite pigmented going on the skin if you have lighter skintone. Sugarbomb actually gave me a lovely flush and glow that looked amazing in photos. Despite its pigment, its sheer enough that it makes a nice beginner blush if you are afraid of blush. Its not like Hot Mama which can make you look too flushed even when you’re being careful. PREVIOUS POST: Should you sleep with your bra on or off? I love it and I can’t wait to get my grubby hands on it! Its gorgeous – I anticipate that its lighter than Clinique’s berries actually. Haha… we are like the Borg – resistence is futile! Oh Oh… Don’t tempt me!! I’m on a college gal budget!! Gosh! How many blushes have you got? Pls don’t temp me!!! I don’t need another blush, no matter how friggin gorgeous it is! I’ve always bought my Benefit Cosmetics from the site as have my friends. So far so good! 🙂 Then again I’ve been lucky – rarely had any problems with the post. I . NEED . SUGARBOMB . Yes Benefit Cosmetics is one of the few sites that ship worldwide and have free international shipping if you buy over a certain amount! 😀 Good to share with friends to make an order. Good luck with your blog! I was looking for it in Singapore a week ago. Like it the moment I saw it. Love the way it includes the plum colour! Apparently, it isn’t on our shelves yet. Seems that the online price is cheaper though (plus shipping might be still the same). We got free shipping so its a lot cheaper than buying it here hehe… perhaps you can get a few friends together and get free ship too? Nice one babe. Can’t wait to collect mine! Are you planning to buy from Benefit online sometime soon. Please include me in.